Olympic bronze medalist J’Den Cox (Columbia, Mo. /Titan Mercury WC) and World champion Logan Stieber (Columbus, Ohio/Titan Mercury WC/Ohio RTC) lead the U.S. men’s freestyle contingent into the Pan American Championships in Lima, Peru, May 3-6. Cox will represent the United States at 92 kg/203 lbs. Among his many credentials include 2017 World bronze medalist and winning three NCAA championships for Missouri. Stieber will man the 65 kg/143 lbs. slot for the U.S. in Peru, a weight class higher than where he won his 2016 World title in Budapest, Hungry. This is his second-straight appearance at the Pan-American Championships. Last year, he finished with a bronze medal. Two-time World medalist James Green (Lincoln, Neb./Sunkist Kids) is a strong favorite to take gold in Peru. Green is a four-time U.S. World Team member and has competed twice at the event, taking home gold in 2017 and silver in 2016. 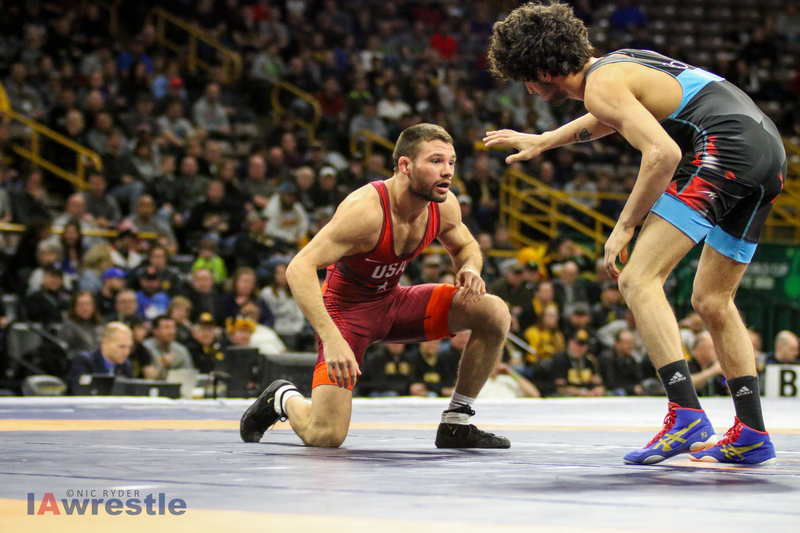 2017 World Silver medalist Thomas Gilman (Iowa City, Iowa/Titan Mercury WC/Hawkeye WC) will compete for the United States at 57 kg/125.5 lbs. The U.S. will be strong at 125 kg/275 lbs. with 2017 World bronze medalist Nick Gwiazdowski (Raleigh, N.C. /Titan Mercury WC/Wolfpack WC). Gwiazdowski was a 2017 U.S. Open champion and a two-time NCAA champion for NC State. Joining them at 86 kg/189 lbs. is 2018 Ivan Yarygin Grand Prix champion David Taylor (State College, Pa. /Nittany Lion WC). Taylor is a five-time National Team member and a two-time NCAA champion for Penn State. The remaining U.S. entrants for the Pan American Championships are two-time Junior World champion Mark Hall (State College, Pa. /Nittany Lion WC) at 79 kg/174 lbs., two-time National Team member Kyven Gadson (Waterloo, Iowa /Sunkist Kids) at 97 kg/213 lbs., three-time NCAA Division III champion for Wisconsin-Oshkosh Nazar Kulchytskyy (Stoughton, Wis./Titan Mercury WC) at 74 kg/163 lbs. and three-time National Team member Brandon Wright (Bloomington, Ind. /New York AC) at 61 kg/134 lbs. The men’s freestyle tournament will be held on May 5-6, the final two days of competition in Peru. Greco-Roman will compete on May 3-4, followed by women’s freestyle on May 4-5. For all four days, the tournament will begin at 10 a.m. local time with the qualification rounds and repechage. The finals are set for 6 p.m. local time each day. Lima, Peru, is situated one hour behind U.S. Eastern Time. The U.S. Greco-Roman and women’s freestyle lineups will be determined after this week’s U.S. Open. The competition will take place in the Sports Center of the National Sports Town, located in Av. Del Aire Block 08, District of San Luis. United World Wrestling will provide a live stream of the event and complete results to those residing in the U.S. through Trackwrestling.com, which is requires a paid subscription. UWW season passes are available for $49.99. April 25, 2018 in Freestyle/Greco, Iowa Hawkeyes, Iowa State Cyclones, NAIA.